About ten thousand years ago, before the sea level rose dramatically at the end of the last Ice Age, Caldey was a hilly peninsula with commanding views over a wide river estuary and the now submerged Carmarthen Plain. Many archaeological finds have confirmed that Caldey was inhabited at that time and continued to be so after it became an island, through the Bronze and Iron Ages and during the Romano-British and Celtic Christian periods. In the 6th century AD the island became known by the Welsh name Ynys Byr or Pyro’s Island, after the first known Abbot. By about the 10th century the Celtic settlement may have been abandoned, possibly as a result of Viking raids. The present name of Caldey is of Norse origin, meaning either ‘Island of the Spring’ (kelda/ey), implying that Viking sailors may have used the island as a source of fresh water, or as held by some scholars, the less appealing ‘Cold Island’ (kaldr/ey). Monasticism returned to the island in the 12th century following the colonisation of South Wales by the Normans. 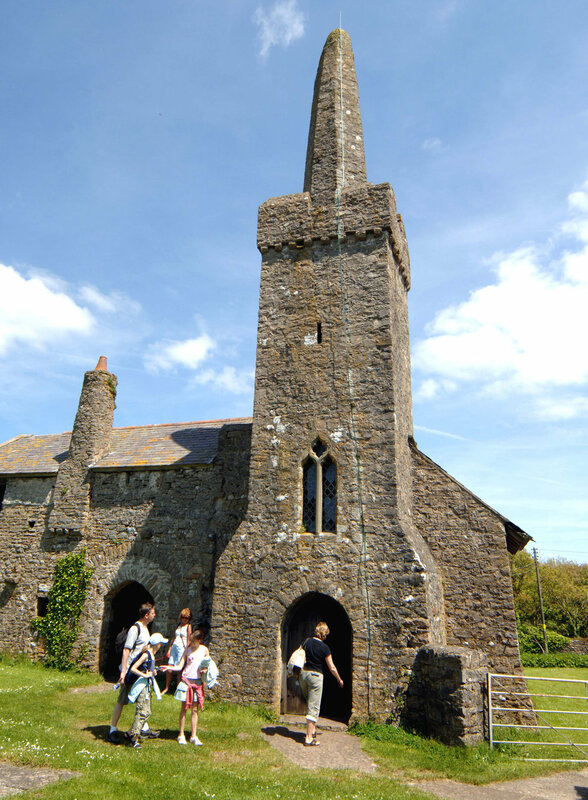 Benedictine monks, originally from Tiron in Normandy, set up an annexe on Caldey to the monastery they had already founded at St Dogmaels in North Pembrokeshire. They remained on the island until the Priory was compelled to close when Henry VIII dissolved the monasteries of England and Wales in 1536. The building they occupied is still standing, and is now known as The Old Priory. From the Dissolution until the start of the 20th century, the island had a succession of private owners and was used for farming and quarrying and may have supported a number of tenant smallholders. In 1906 it was bought by a community of Anglican Benedictines. They built the present Abbey, restored St David’s Church and refurbished the workmen’s cottages in the village. Slate roofs were replaced by the distinctive red tiles which are now such a feature of the island. In 1913 the community converted to Catholicism and in 1925 sold the island to the Cistercian Order, to be occupied by a group of monks from Scourmont Abbey in Belgium. The Cistercians, who are a stricter offshoot of the Benedictine Order, took up residence in 1929, re-establishing a historical tradition of Cistercian monasticism in Wales. Before the Dissolution there had been 13 houses of Cistercian monks in Wales, including such well known sites as Tintern Abbey and Strata Florida. Today the successors of the first Caldey Cistercians continue to pursue their vocation of prayer, study and work, carrying the torch of Caldey’s long monastic heritage into the 21st century.